Cyprus is an island of considerable contrast. It has toasty sunny beaches and cooler forest clad mountains. It has small villages giving a hint of traditional island life and larger cosmopolitan towns where you will see brand names that you might see in your home town. In the spring especially, it has the most fantastic growth of wild flowers and shrubs, yet it has a highly efficient modern farming community producing some of the tastiest fresh produce you will ever experience. It is the third largest island in the Mediterranean but still small enough to explore. 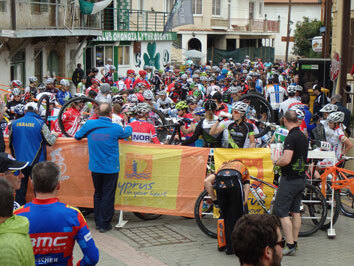 During the last few years Cyprus is becoming a well known destination for the winter preparation of elite of athletes and cyclists but also a paradise for cycle tourists. Ideal climatologically conditions during the months of October to May allow the friends of cycling to train and practise their favour sport without the restrictions because of weather conditions that prevail in central and north of Europe. The topology of the ground in the island allows the cyclists to select the suitable way that corresponds in their abilities and preferences. Frequent alternations of landscape and the splendid Cypriot and Mediterranean nature give the cyclists calm and peacefulness. Characteristic of Cyprus is the small size and the small distances in which someone can find variety of trails so much for road cycling and mountain biking. Also close from the sea and the beaches the cyclists can find appropriate ways in the mountains and the hilly landscape. Great weather, challenging country trails and ideal infrastructure make Cyprus the perfect place for mountain bikers and road bikers.